Athletic teams and extracurricular activities teach and enhance leadership, introduce and strengthen a range of skills, allow students to be part of a community within a community, and facilitate new associations with others who share a common interest. The overall goal of both programs is to enrich the lives of students beyond the classroom. Athletics at Horace Mann are a natural outgrowth of the Physical Education program. 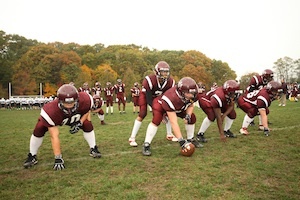 While the School has been fortunate to enjoy successes for both teams and individuals, the intended purpose of the program is to teach and endorse long-term physical and mental health. Students learn to collaborate, compete, set goals, and abide by the rules of fair play. Preparation for team sports begins in the upper elementary years, where physical education classes include units with a variety of specific sport-based skills. Team sport competition is introduced at the Middle Division during seventh grade. 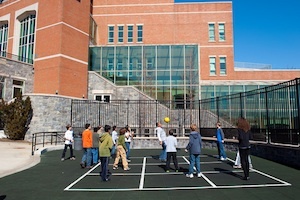 Students who are not on teams continue in the required Physical Education program that includes an intramural segment in the third rotation every trimester. The Lower Division after school program provides a time for students to explore an academic program, a sports activity or a special interest outside of the classroom environment. Small classes allow for individual growth and accomplishment. Opportunities to socialize with peers and work with a supportive faculty are available for students from kindergarten through fifth grade. There are two major publications in the Middle Division. The yearbook, Reflections, is printed each May with a thematic review of the events of the year and photos of students. The literary publication, MUSE is published annually. Middle Division students may write for the high school newspaper, The Record. Clubs created by students meet during lunch periods and vary from year to year. Chosen by application, students can participate in the six committees of HM Lead: Student Concerns, Student Activities, Diversity, Sustainability, Peer Mentoring and Service Learning. HM Lead holds an annual retreat and other training in leadership skills for its members. In addition, students have the option to participate in a Middle Division theatre production each year. The Upper Division offers a wide array of clubs for students who have the desire to augment and enrich their academic curriculum. Club periods are scheduled twice a week at the end of the school day. Clubs are led by students, advised by a faculty member, and supported by school resources. Students are advised that it is better to make a significant commitment to one or two clubs that are of great interest than it is to join many clubs and be active in none of them. There is a process that enables students to start a new club if there is not one that currently exists for their interest. At present, there are sixty-plus active clubs. Publications are a prominent part of life at Horace Mann. More than half of our students write for one or more publications during their time here. Each publication has a faculty advisor who works closely with student writers and editors. Many publications have won awards given by national scholastic press associations. There are presently twenty-plus publications available.